Interior elements for the house, sand box cover, basement screen. 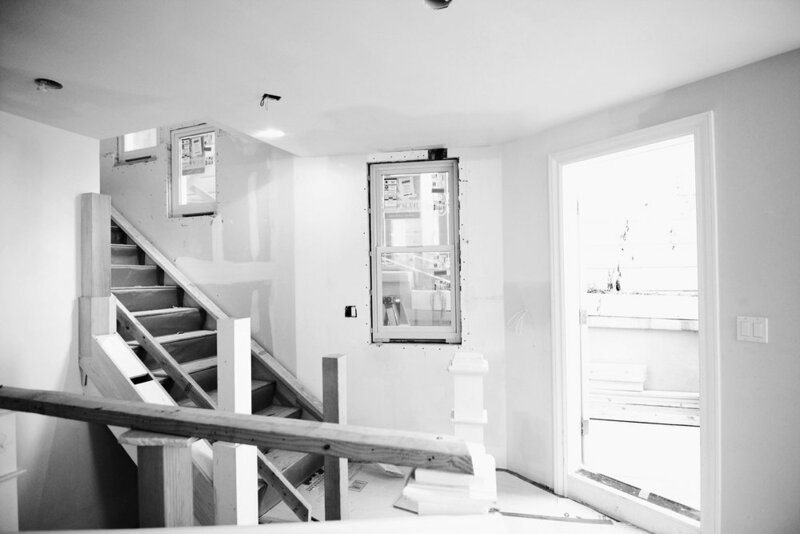 We were brought in to renovate the home, connect the main floor and basement levels with a new stair, open up the interior to accommodate a growing family. We removed an old closet and added a new beam overhead, which allowed us to dramatically open up the space to include breakfast areas, as well as let more natural light into the home. Before, one would have to go outside to access the basement. The new stairs to the lower level basement is now tucked behind the existing stair. 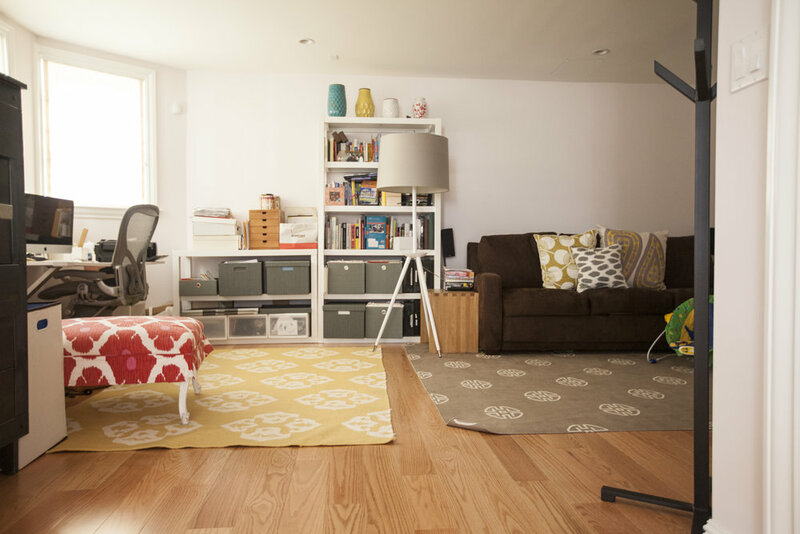 By making this minor change, we enabled fluid movement throughout all levels of the home. The new stairs in place with final finishes. This was the most complicated area of the design, fitting in the three levels of stairs in this small area. Lots of light was added with windows along the stairway and overhead recessed lighting in the ceiling. The stairs from the first floor go straight down to the basement and garage. The whole house is now tied together with a unified feel, with seamless access throughout all floors. Going outside to the back yard, we designed an easy to use sandbox cover, for kid safety, and to keep the cats and rain out. Water heater & pipe screens were designed by us; now the basement is safe for the young ones and more pleasing to the eye! Opening up the interior in a clever way allowed us to almost double the size of the kitchen. 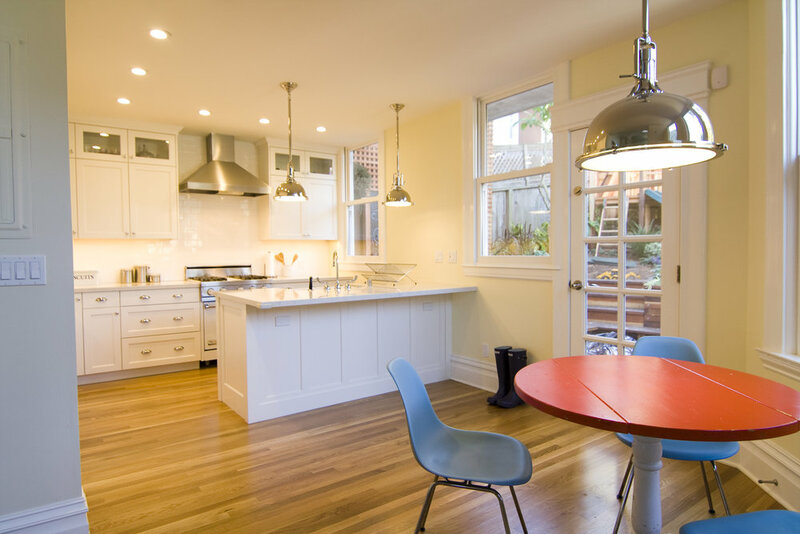 Lighting fixtures, white subway tile and other details pull together a warm yet modern feel. A refreshed & clean look to simplify and create a relaxed aesthetic in the kitchen. Like many older homes in the Bay Area, this wonderful little house suffered from many issues. We helped the family sort out the myriad unfinished permitting and construction issues left by a prior contractor. 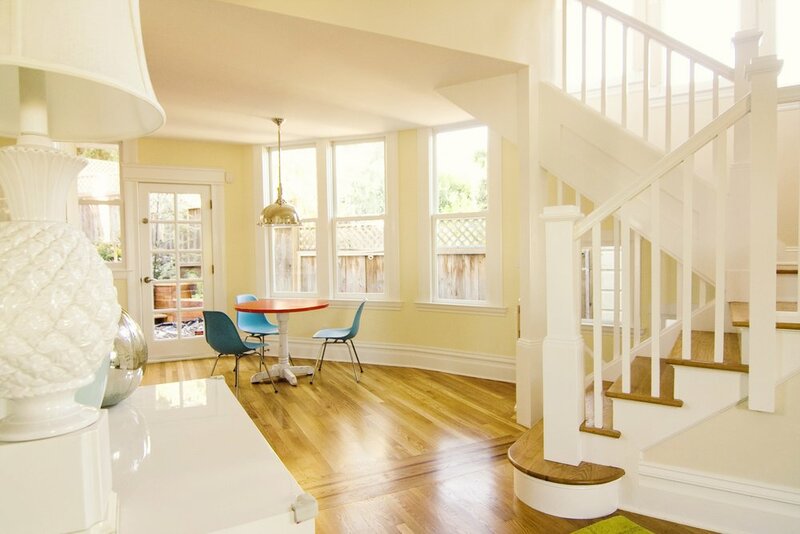 This charming house is full of quaint vistas and cozy spaces, such as this turret-seating living room. Almost transparent, yet durable and decorative plexiglass window guards were added to accommodate the impact of two young boys, as well as protect them! We had to lower the floor of ground level living space to make it a legal habitable area. Now bright and open it is ready to be moved into. The new open-ness of the space and the way the stairs have been tucked over to one side make this now a wonderful house for a growing family. This San Francisco family came to us as they were expecting their third child. They needed more space! We helped them recognize that the house had plenty of space, all it needed was some interior renovations. Creating a design for the kitchen that gave them the storage and usability they desired, and creating access to the rarely used basement by adding internal stairs that flow, gave them the house they needed for their growing family. We also helped them keep a fun, fashionable aesthetic in the face of child rearing with some accident preventing pieces throughout the house. Carved acrylic screens over their windows, a cover in the basement over the exposed boiler, and a sandbox lid all with the same aesthetic fashion, and child protecting features.